We manufacture and export high quality double profile corrugation machine. 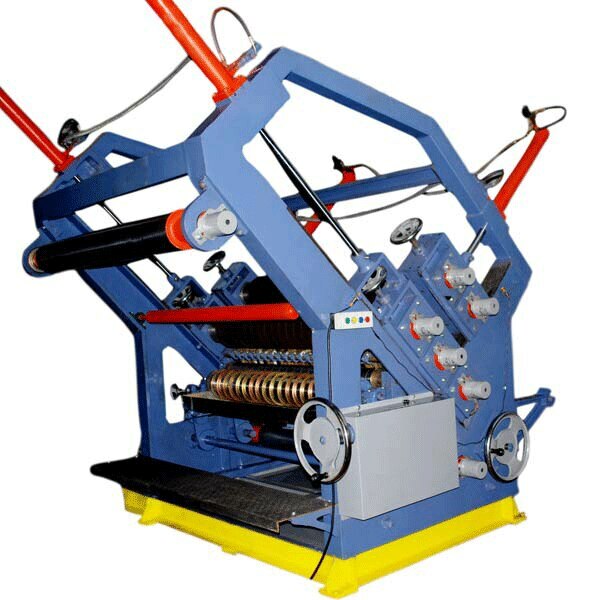 Our machine has high rate of production for two ply corrugated sheets or rolls. We use the best quality of raw materials like graded casting, Siemens/ABB electric motors, good quality bearings etc. Once the flute rolls are set no further adjustments are required. This machine uses two flute profiles in one machine , so that there is quick change over from one flute to another with least production loss time. Machine is equipped with AC Drive for variable speed and Hydraulic Reel Stand is provided with this high speed machine. The machine is manufactured such that there is easy changeover from one flute catridge to another flute catridge. This easy change gives great flexibility to choose flute profile of requirement. All moving parts are protected by safety guards. Flute rolls are very important feature of this machine and are minutely finished. Flute Rolls are mounted on heavy duty spherical roller bearings for long life. Flute Rolls are made of special alloy steel for better performance and long life. Star Make Double Profile High Speed Corrugating Machine, Bearing Mounted, Provided with Hydraulic Power Pack, Provided with Two sets of Forged Alloy Steel Flute Rolls Pressure Roller Alloy Steel. Heaters Each for 2 + 2 flute roller and one pressure roller are provided with the machine. Heaters are made of heavy duty Stainless Steel, Pre-heater 2 in number are also provided ,Machine is provided with Digital Temperature Control panel , Electric motors Siemens / ABB Make. AC Drive Siemens/ABB Make, are also provided ,Drive to Roller is provided from Gear Box, Gum Tray of galvanized sheet, Hydraulic Reel Stand. Complete Machine.